From left to right: Partners in Patriotism Fund Grant Committee member Cindy Venuto, Grants Committee Vice Chair Mark Powers, Foxborough High School senior Brian DeVellis, Foxborough High School Class of 2015 President Kayla Sepe, Grants Committee Chair Jimmy McGowan and Grants Committee member Livia Binks. The Partners in Patriotism Fund, established by the Kraft family in 2014, recently donated $5,000 to the FHS Class of 2015 to assist the departing seniors in building a garden in memory of their classmate, Sam Berns. Grant to assist the Foxborough High School Class of 2015 in building a garden in memory of their classmate, Sam Berns. 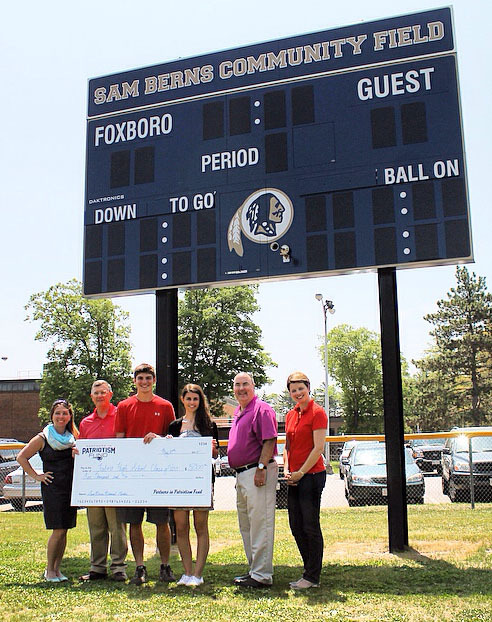 As graduation day approaches, the Foxborough High School Class of 2015 plans to give the community a meaningful gift inspired by their dear friend and classmate, Sam Berns, who passed away from progeria in January 2014. Needing approximately $15,000 to build a garden and walkway with benches and a plaque at the Sam Berns Community Field, the graduating class recently received a $5,000 grant from the Partners in Patriotism Fund, which will assist in the cost of materials and labor needed for the project. Foxborough High School senior Brian DeVellis, who helped spearhead the class gift with Sepe, class adviser Kristen D’Errico and class officers, Meggie Maguire (vice president), Lauren Sampson (secretary) and Timothy O’Toole (treasurer), said these funds will help the class incorporate more elements into the project. Sepe said the garden and walkway should be set in time for graduation on June 7, but the project likely won’t be completed until a few weeks after. After learning of the project, the Fund’s Grants Committee was thrilled to support the Class of 2015’s efforts. Grants Committee member Margaret Chaisson, who was Berns’ Cub Scout leader for several years, said she thought this project was a perfect fit for the Partners in Patriotism Fund to support because of Berns’ positive outlook on life and his impact on his classmates, the town, the Kraft organization and beyond. While resident Livia Binks never had the opportunity to meet Berns, she found him and his legacy to be one of the main reasons she applied to serve on the Fund’s Grants Committee. Sepe said she hopes the class gift will give testament to Berns’ character and values as members of the community walk onto the field for years to come. She added the project will help tell visitors what Berns meant to Foxborough. For DeVellis, the project establishes a lasting legacy of Berns with meaningful input from his classmates and friends on how it should be done. In addition to the Partners in Patriotism Fund donation, the Class of 2015 raised more than $6,000 on its Go Fund Me account (http://www.gofundme.com/t4ycew) and received many contributions from the community, including concrete and labor donated by Chris McNamara, owner of C Mac, Inc. and a plaque of Berns, donated by John Ricker, owner of Morse & Beggs Monument Company. The Partners in Patriotism Fund, established by the Kraft family in 2014, has awarded more than $40,000 in grants to a variety of Foxborough-based organizations and community initiatives. The Fund’s Grants Committee, comprised of Foxborough residents, meets on a monthly basis at Gillette Stadium to review and vote on grant applications it has received. $5,000 to the Foxboro Recreation Department to assist in funding the construction of dugouts at the Payson Road athletic complex. $2,000 to the Foxborough Founders Day Committee to assist in funding the cost of the Founders Day Fireworks. $2,000 to the Friends of the Boyden Library to assist in funding the town-wide Children’s Foxborough Reads program based on the children’s book, “The Lion, the Witch and the Wardrobe,” by C.S. Lewis. $1,500 to the Foxborough Public Schools to send three Ahern Middle School students to the program, “Envision the Future – a STEM Program” offered at Bridgewater State University from July 20-24. $660 to the Foxborough All Night Graduation Party Committee to assist in the cost of gifts purchased for the Class of 2015. Additionally, the Grants Committee has awarded nearly $11,000 in personal assistance grants. Serving on the Grants Committee in 2015 are Binks, Chaisson, Arthur Jewett, Charles Liftman, McGowan (chair), Thomas Murphy, Mark Powers (vice chair), Carolyn Rehill, Mike Stewart (secretary), Jenna Strickland and Cindy Venuto. For grant applications or more information about the Partners in Patriotism Fund, please visit GilletteStadium.com/Partners-in-Patriotism.